About Lac Seul Floating Lodges - Hudson, Ontario: Family owned and operated for over 30 years, Explore Lac Seul on a private house boat. 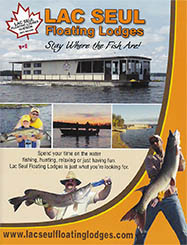 Lac Seul Floating Lodges is based in Hudson, Ontario, Canada. Family owned and operated for over 40 years, we have the experience to get you started right for your houseboat vacation. Our company believes in treating you like family, not just a customer. We offer the personal touch to ensure you get the most from your house boating experience. The Starratt family has made many contributions to Hudson and the surrounding community and has always been located, in some form, on Lac Seul. From R.W. Starratt who first started Starratt Airways, back in the 1930's, to Don and Dean Starratt with Starratt Transportation, up to the 1980's, to Lac Seul Floating Lodges today, they have always made Hudson and Lac Seul home. At one time, roads did not exist north of Hudson. The mines that were operated out of Red Lake, Uchi Lake and Pickle Lake relied on Starratt Airways and Transportation to haul in supplies. The freight was moved with trucks, tractor trains, boats or scows depending on the season. More recently Starratt Transportation moved freight to the Hudson Bay Post and Camp 19 until the logging camp closed down in the 1970's and the store closed in the mid 1990's. Old pictures of the Hudson waterfront are up in our office dating back to 1935. Drop in to have a look! With Lac Seul being a main transportation route, the Canadian Coast Guard contracted the placement and maintenance of the lake markers to Dave and Don Starratt. Even though the contract was cancelled in the earlier 1990's, we still try to maintain those markers and their location each year on the east end of Lac Seul. Today, we continue our efforts through our charitable donations to Easter Seals - Snowarama. We also help with the maintenance and up keep of the Memorial Cairns by replacing the flags every spring. These Cairns are along the shores of Lac Seul and are dedicated to members of the Legion Branch #139, from Hudson, who fought and died in WWII. Those of you who have been on the east end of Lac Seul would have past by these momuments. Please visit our Legion Branch #139 page for more information.